I’d like to start this post by talking about the director of Gundam Build Fighters, Kenji Nagasaki. Nagasaki started out as a production runner on various Madhouse shows and moved on up to directing and storyboarding over the years. He’s worked on a variety of shows for them. His connection to Sunrise begins with Gundam 00 where he was the assistant director for both seasons and the movie. He had a smaller role on Gundam AGE; during this time he was also working on a variety of Studio BONES anime such as No.6, Blast of Tempest and Eureka AO, this would also be the start of his relationship with Bones. As a side note Nagasaki is a big fan of Victory Gundam, a show often not well liked by other Gundam fans, and managed to insert several nods and homages to it throughout the show. Next up is the writer Yousuke Kuroda. Kuroda is the name behind several of Sunrise’s popular shows such as Infinite Ryuvis, S-Cry-Ed, Gundam 00 and the Gunpla Builders OVA. As with many of his original works, Kuroda is credited for script writing all the episodes, as such the show has a very cohesive factor since it’s all from one person. Another name to mention is the show’s Assistant Director Kazuki Tsunoda. He too began working with Sunrise on Gundam 00, moving on to AGE where he shared Assistant Directing duties with Kazuo Sakai. Getting back to BF, while Nagasaki did the usual directorial duties of helping to plan the show and directing the 1st and last episodes, it was Tsunoda who jumped into to the meat of the show directing several episodes in between. The show’s character design credit is a strange one. Suzuhito Yasuda of Durarara and Yozokura Quartet fame is credited with “Character Design Assistance” however it is Kenichi Ohnuki is credited as Character Designer. Normally one might think Yasuda provided the concepts and Ohnuki refined them to be used on animation. However tweets by Yasuda from the show’s announcement tell us that much of his original designs were discarded by the production committee and there is little left in the final designs that resemble his original ideas, he wonders why they would even give him such a credit. So I can imagine Ohnuki was tasked with taking Yasuda’s designs and re-making them to something the committee could agree with. However he seems to have recanted that stance and accepts his role as original character designer on the show. Now for mecha animation, the show credits Hiroshi Arisawa and Se Jun Kim as “Chief Mecha Animators”. I speculated before the show started airing that this role might go to Ken Otsuka given he did the same for Gundam AGE but it turned out much differently. I’d say for the better too as both Arisawa and Kim are part of Sunrise’s younger mecha animator generation, so giving them a chance to lead on a show was valuable experience for them. Both Arisawa and Kim have worked on Gundam shows for Sunrise for many years. Kim was relatively unknown until Gundam AGE where he blossomed into a magnificent action and effects animator and he definitely brought the same pizazz on to BF. Arisawa’s role leant towards creating the animation models for the mecha while Kim was in charge of effects animation. Interestingly as the show was leading up to airing, the show’s official account on Twitter spent some time introducing the animation directors that would be participating on the show. The majority of them being the mecha animation directors to boot. They introduced the leads Se Jun Kim and Hiroshi Arisawa of course but they also gave mention to the following: Munetaka Abe, Shinya Kusumegi, Ken Otsuka, Takase Kenichi, Hiroki Mutaguchi, Michinori Chiba and finally Masami Obari. With Chiba being the only character AD introduced, but it’s understandable given he’s had a long running relationship with Gundam shows. There is the show’s musical composer Yuuki Hayashi. Formerly one of Hiroyuki Sawano’s assistants, he’s flown mostly under the radar amongst anime fans doing live action TV and anime work here and there. It is with Build Fighters’s soundtrack that he has finally come into the spotlight. 2013 and 2014 have been great for him, things only look to get better. Finally there is the show’s producer Masakazu Ogawa. Another fairly new person who was recently promoted to lead producer status. While on Gundam 00 and Gundam AGE there were other senior producers above him but on BF it seems he’s been given lead producer status. He seems to have been the one who decided to promote the mecha animators on twitter and enjoys giving them all exposure. As I’ve gone through much of the lead staff members it’ll have become apparent to you that some of them are younger, relatively unknown people, who have been given the chance to lead parts of this project. After the massive failure that was Gundam AGE, it seems strange for Sunrise to do this. It seems though Sunrise’s expectations for the show were much lowered as well. Build Fighters is a shift from regular Gundam shows in that it aired on a Monday evening 6pm timeslot. This time of the day is usually reserved for cartoons aimed at younger kids, since they’ve usually come home from school around this time. While it is still a prime time slot, it’s a relatively smaller risk than having the show air in the same slot as Gundam 00 and AGE which were prime-time Saturday evening timeslots. In the Monday slot, BF also has the opportunity to piggy back off other shows aimed at kids such as Cardfight Vanguard. By also having the show only air for 2 cour, there was much less to put at risk than having a 4 cour Gundam show as usual. The release of the soundtrack also gives us an idea that the production company were gauging interest in the show before they committed to releasing a soundtrack CD. Soundtrack releases for kids shows are not too common, so once the show started airing and people were beginning to enjoy the music, it was only then that the soundtrack CD was greenlit and Hayashi was put to work to finalise a set for release. I’ll begin with Hiroshi Arisawa who is a graduate of the Yoyogi Animation Academy and was attached to studio Wanpack for much of his early career. Eventually he made the shift to go freelance, but has kept strong ties to Studio Sunrise and works on their shows very often, especially their Gundam productions. Age-wise I’d say he’s in his mid-30s right now. So he’s had a good 10-15 years of working in the industry. As many of the core staff members on this show, Arisawa is primarily a mecha animator. I will admit at first I thought he wasn’t particularly impressive, mainly because I just didn’t know what he worked on, but once I saw the kind of work he actually did I soon came to appreciate his talents. The mecha he draws often have a very straight, clear cut form. He loves to employ lines drawn with rulers. He has a good way with smoke effects and enjoys using varying camera angles to portray movement. Unfortunately on BF, due to the nature of his job as chief mecha animator, he was really only able to showcase his talents on episode 1. He spent much of the rest of the show essentially fixing animation and doing secondary key animation for cuts that weren’t going to be finished on time. Now this chap is someone people may be more familliar with, and probably with good reason as his animation really stands out. He originally hails from South Korea and came to Japan in 2003 where he studied at a vocational school before he joined Sunrise. He’s been working for them since, with the occasional work outside the studio. He pretty much blossomed into the animator he is today over the duration of Gundam AGE back in 2011, his flashy and expressive animation caught the eyes of many. On BF he continued to showcase that brilliance in several of the episodes where he was the AD for as well as the openings and endings. His work on the 2nd ending is particularly interesting. The ED didn’t feature that much mecha nor movement, so as a bit of an ad-lib he decided to animate the final shot as stylishly as he could (see below). Abe is a long time mecha animator, having worked in the industry since the late 80s. He’s worked on a variety of shows over the years though he is probably best known for his work on the Japanese made Transformer shows. Those transformer shows are often made with low budgets, however whenever Abe worked on a scene his particular style of 2D animation and timing shone through brilliantly. Unfortunately on Build Fighters his work doesn’t shine quite as strongly as the other ADs. 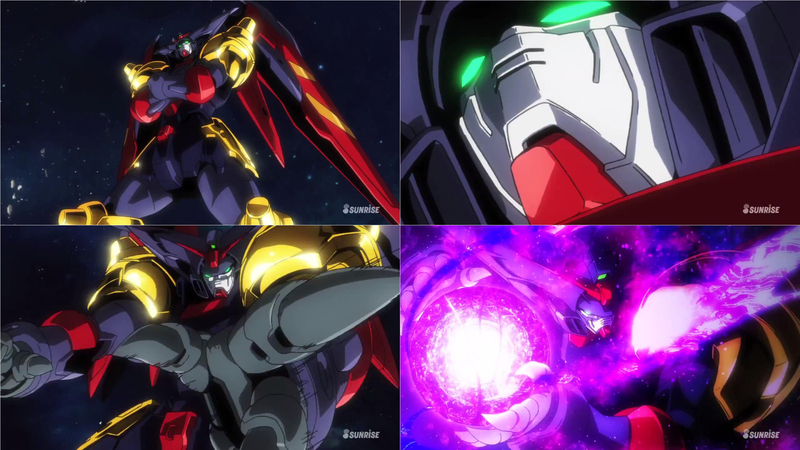 Towards the end of episode 3 there is some nice lively mecha animation for a few seconds that I believe is Abe’s work. Kusumegi is one of Sunrise’s regular animators. Making his debut around the turn of the millennium. He originates from a sub-contracting studio known as Studio Takuranke. Takuranke have close ties with Sunrise and have often worked on their shows. He’s worked on SEED, Xenoglossia, 00, Zegapain, AGE and of course BF. 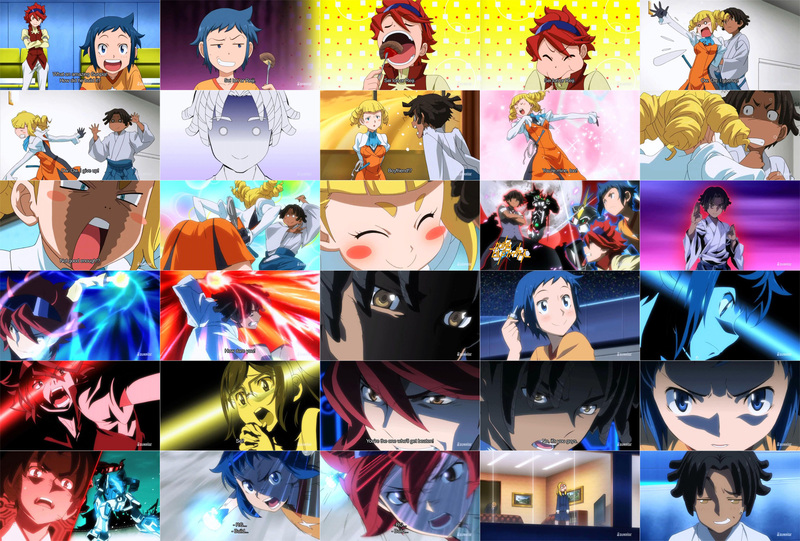 On Build Fighters I wasn’t able to pin down any particular animation style or visual aesthetic to Kusumegi. Although from what I know he’s done on AGE and the 00 movie he seems to enjoy animating shots that move to and from the camera quite well. Otsuka is no stranger to both Sunrise anime and mecha anime. Having lead the mecha animation side on Gundam AGE, he decided to take a lesser role on BF. That said he was able to flex his storyboarding prowess on the episodes he was the AD for, giving him slightly more control over the action than an AD would normally achieve. His episodes were relatively good looking, neither the worst nor quite the best. Interesting to note that on the final episode Otsuka drew the cuts for the Master Gundam in the drawing style of Hirotoshi Sano, especially the kind of work Sano became famous for on G Gundam. Kenichi Takase is a former Nakamura Pro animator. Ever since he left Nakamura Pro around 2009/10 he’s used the Shindo alias whenever he works on Sunrise shows. He seems to be a pupil of Eiji Nakada who is also a Nakamura Pro alumni. Interestingly Nakada is a pupil of Ken Otsuka who is again a former Nakamura Pro member. These kinds of relationships tend to permeate the animator world. BF episodes 6 and and 13 were probably the highlights of Takase’s work. Episode 6 features quite a fair amount of gruelling mecha action and detail handed down from Iwao Teraoka’s storyboard while episode 13 features some really cool usage of effect animation. For those that read this blog, this person needs no introduction. I’m sure that after working on Gundam AGE, Ken Otsuka likely invited Obari to work on the up and coming Gundam show that was more child focused and relaxed about animation consistency rules. Obari loves working on children’s robot cartoons, after all he worked for many years on the Braves robot cartoons in the 90s. With Build Fighters Obari managed to make his debut working as an AD for a Gundam show. As far as his episodes go, episode 7 was a relatively simple affair with some interesting layout work but it is episode 15 that shines through. 15 features quite a fair amount of action and Obari’s talent for bringing stylish sequences comes to life. 23 was mainly a low budget episode, but what little action that appears, seems to have Obari’s hand in it once again. I speculate the co-storyboard credit for Obari was for the action scenes. Hiroki Mutaguchi is a freelance mecha animator. He’s worked on several mecha shows displaying his particular take on Obari’s style. Mutaguchi was invited to work on Build Fighters after meeting Sejoon Kim whilst working on Ironman Rise of the Technovore. Mutaguchi is a massive fan of SD Gundam side of the franchise. Mutaguchi’s first episode was #9 which was a SD Gundam focused episode. What I’ve noticed is that he’s worked as an Effect AD on some projects in recent years and as a result his effect work has improved and can be seen on some of his cuts. Chiba is a veteran of Gundam shows, having been lead character AD on several past shows. I always thought of him as the defacto guy for pretty-boy characters. However on Build Fighters he unleashed a different side to him and almost all of his episodes feature a goofier and cartoonier visual style, much to my surprise. Chiba is also one of Nakamura Pro’s former members and is no stranger to mecha animation, but for Build Fighters, it is his character work he will be remembered for. Much like how Kim came to the spotlight during Gundam AGE, I think the award for best beginner on BF probably goes to Ohashi. Ohashi is a relatively new animator, I don’t really know much about Ohashi but he’s only been working on shows since around 2010. He’s been mainly working on various shows directed by Tetsuya Yanagisawa at the TNK studio, but he came to work on 3 episodes of Build Fighters, 12, 15 and 23. His cuts were short but they were impressive in terms of timing and effects. He’s still fairly young so I think there’s a lot more we can look forward to seeing from him in the future. I think a mention has to go out to Iwao Teraoka, whom I mentioned in passing earlier. Teraoka is one of the storyboard artists that worked on the show. It was duckroll that initially told us about him, how Teraoka has worked on Gundam series often and it is because of him that we got to see some excellent fight scenes in episode 6. He has a good eye for detail and enjoys incorporating that detail into scenes. Teraoka is actually an animator who has shifted to storyboarding quite often in the past few years. He initially came from a studio called Ad Cosmo, that worked often on Sunrise shows in the 90s such as entries in the Braves franchise, Gasaraki and Betterman. 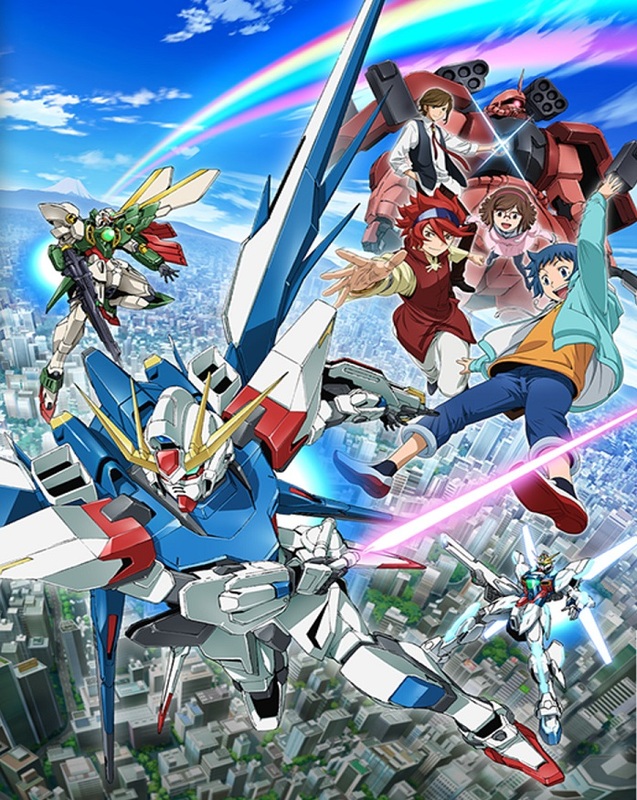 Overall Gundam Build Fighters might not necessarily have been a ‘sakuga anime’ but it was a show packed full of people who cared enough to make it exciting to watch. Partly down to the producer who gave the animators more freedom than a regular Gundam show would allow and partly from the animators and directors themselves who wanted to make each episode exciting to watch. At the core of it, Build Fighters is a celebration of all things Gundam and this showed not only in the characters and story but through the animation work as well. This entry was posted in Animators, Anime Insight and tagged Animators, Gundam, Gundam Build Fighters, Mecha. Bookmark the permalink. And then Kim left the Build Fighters project to work on G-Reco instead and everyone got sad.